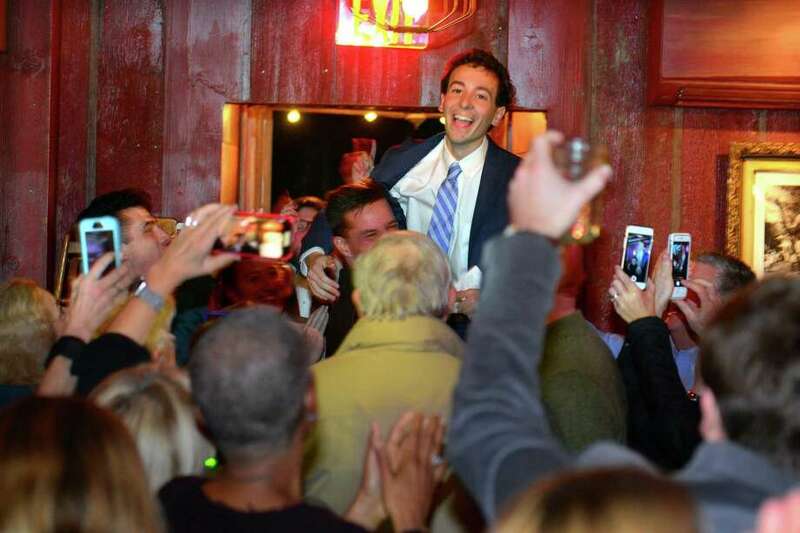 Democrat Will Haskell is lifted up by a supporter after learning he just defeated incumbent Republican Toni Boucher for state senate during a post election party at the Little Barn in Westport, Conn., on Tuesday Nov. 6, 2018. WESTPORT — In a historic victory, 22-year-old Will Haskell defeated a 22-year veteran of the state legislature, Toni Boucher, turning the 26th Senate District blue for the first time since 1973. Motivated to fight back against President Donald Trump’s agenda, Haskell, who graduated from Georgetown University in May, launched an insurgent campaign fueled by energized Democrats and visions of a millennial-friendly state with modernized infrastructure and progressive social policies. The odds were against Haskell, a Democrat, when he set out to challenge Boucher, a Republican, who since 2008 has held the 26th district, which includes parts of Bethel, New Canaan, Redding, Ridgefield, Weston, Westport and Wilton. A formidable incumbent, Boucher, 68, beat her Democratic opponent by nearly 12,000 votes in the 2016 election. Before winning a spot in the senate, she served a dozen years in the 143rd House District, which includes her hometown of Wilton and nearby New Canaan. But at 3 p.m. on Election Day, Haskell said record turnout left him feeling optimistic. “I’ve been standing in Ridgefield and Wilton all morning and people kept coming up to me, even some Republicans, saying their kid convinced them to vote for me or they’re voting Democrat for the first time. I think that’s a good sign,” Haskell said. As the votes trickled, Haskell’s supporters gathered at the Little Barn restaurant in Westport felt ready to explode with excitement, but it was not until after 10:50 p.m., when Boucher called Haskell to concede the race, that he gave a victory speech. “Young people are not the future, they are the present,” Haskell told his followers. In the end, he took 53.3 percent of the vote compared to Boucher’s 46.69 percent, an astonishing change from the 2016 election when Boucher won 60.19 percent of the vote and her Democratic opponent Carolanne Curry earned only 39.81 percent. In real numbers, Haskell won 27,991 votes while Boucher received 24,521 votes, according to unofficial results provided by the Secretary of the State’s office Wednesday morning. In 2016, Boucher received 34,627 votes verse Curry’s 22,898. Despite record turnout, 5,013 less people voted for a candidate in the 26th District race in 2018 compared to 2016. A 2014 Staples High School graduate, Haskell, who now lives in New Canaan, knocked on 4,000 doors, held 142 meet-and-greet at area homes, and amassed a sizable following of supporters throughout his campaign. Young people, some not even old enough to vote, volunteered for his campaign in droves, called to what Haskell said is his top priority: stricter gun regulation and an end to the epidemic of school shootings. “They’ve all worked so hard for someone they can’t even vote for,” Kaila Finn, a Westport native and Scripps College junior, said outside the Long Lots Elementary School polling place at 3 p.m., standing next to four other young women, the rest too young to vote and from towns across the 26th District, who each spent time volunteering for the Haskell campaign. In Westport, Haskell’s win solidifies a decades-long trend of increased Democratic registration in the town. The number of registered Democrats in Westport has increased from 6,322 registered Democrats in 2010 to 7,187 this year. The number of registered Republicans likewise decreased from 4,921 registered Republicans in 2010 to 4,446 registered Republicans this year, according to data from the registrar’s office the day before the election. Bucking the trend of many Fairfield County representatives, Haskell supports a regional approach to economic development and said he’ll vote for tolls to fund transportation improvements. Despite his outsider status in the state legislature, Haskell has deep connections with the Democratic powers that be and previously interned for Rep. Jim Himes, Sen. Chris Murphy, and Hillary Clinton. President Barack Obama endorsed his campaign last month. Haskell self-identifies as an economic moderate and often touts he is not endorsed by the labor unions. Indeed, like a fellow Georgetown University alumni, President Bill Clinton, Haskell sought to forge a new, more moderate, path for Democrats in unlikely territory and, undeterred by the challenge, succeeded.